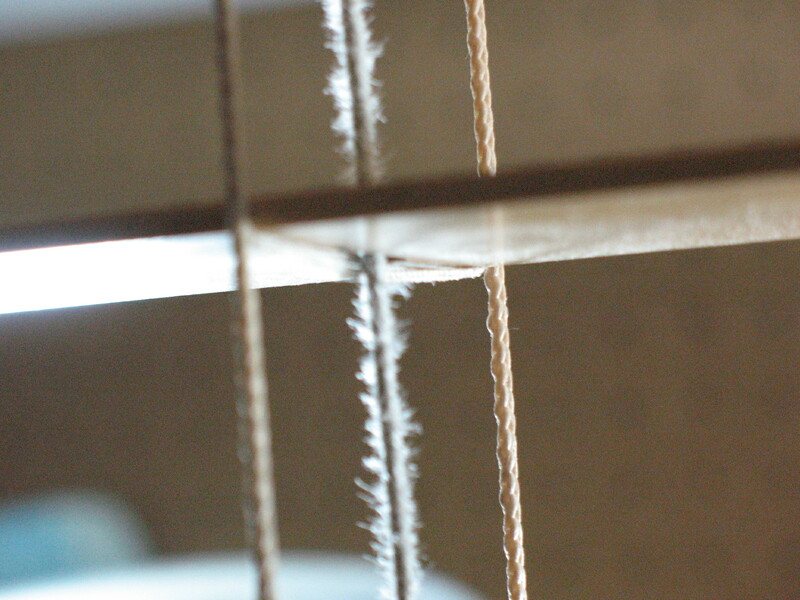 Yesterday, I replaced the lift cords on a 2″ wood blind that had one broken string and another that was badly frayed and probably would have broken soon. Restringing a wood blind is usually a bit of a yawner, but this one was kind of interesting because it illustrates a problem that is common with wood blinds and faux wood blinds. Three blinds on one headrail. This particular blind was from a large window that was almost 8 ft. wide. It was actually 3 wood blinds all on the same headrail. You’ve probably seen windows like this. They usually have two smaller panes of glass on either end that can be opened or closed and one larger fixed pane in the center. A typical treatment involves 3 separate blinds, one for each pane. Breaking a big blind up into 3 smaller blinds reduces the size and weight of each individual blind making them more reliable and easier to operate. The frayed and broken strings were all on the larger blind in the middle. Even though the window covering had been split up into three smaller blinds, the larger of the 3 was still big enough to cause trouble. These two photos show lift cords as they are routed through the holes in the bottom of the headrail. 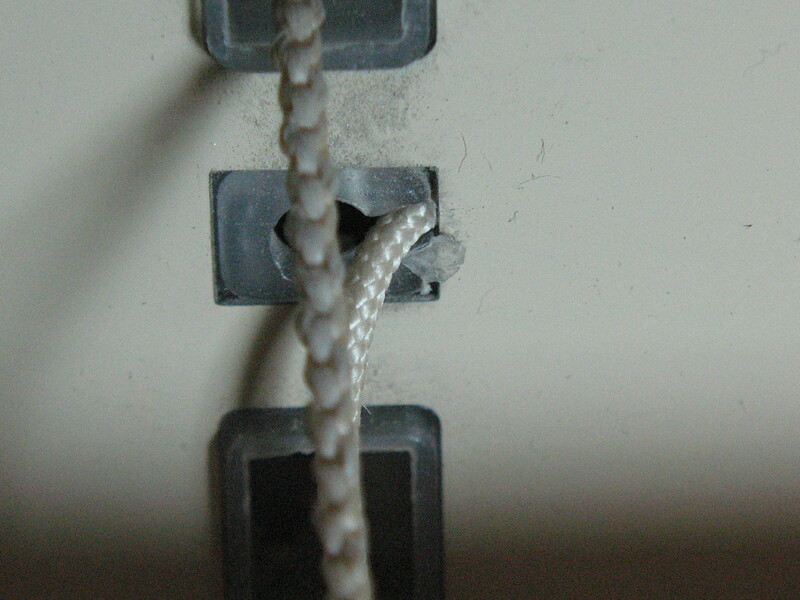 You can see the clear plastic inserts that are intended to protect the cords from the unfinished edges of the “route holes” that have been punched through the metal headrail. 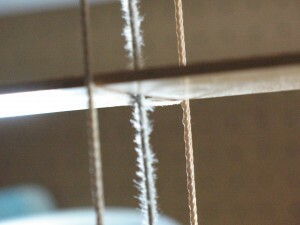 This photo shows the lift cord for one of the smaller blinds. 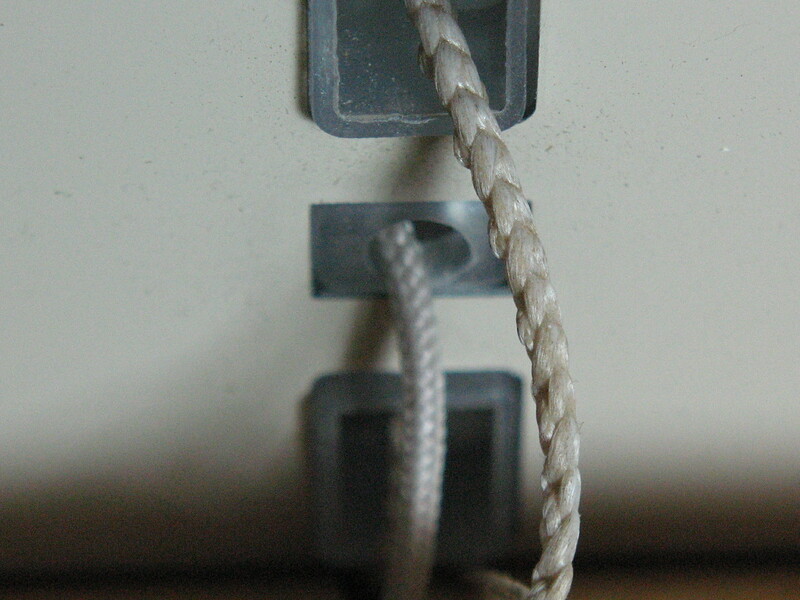 The cord is shown passing through the small round hole in the center of the headrail. The plastic insert is intact and doing its job of protecting the cord from the metal edge. This photo shows one of the lift cords for the larger center blind. You can see how normal daily usage and the weight of the blind has caused the cord to cut through the plastic insert. The lift cord is now rubbing against the metal edge of the route hole. This photo was taken after the frayed cord was replaced so you don’t see any fraying – yet. Why restring if the weakness is in the design? The obvious solution would seem to be to replace that plastic insert, but it’s usually not that easy. Parts availability is often an issue. Even if a replacement part is available it is likely to fail again for the same reason. Though restringing is only a temporary fix, it does allow you to continue to use the blind while you plan for replacement.